Alkaline water is a health trend right now, with home ionizer machines selling for thousands of dollars. Let me let you in on this awesome little secret: you can easily and cheaply make ionized water with this simple recipe. AND you get the added benefit of making a mineral water by adding magnesium! I did a series on the health benefits of magnesium, and I shared a really simple recipe for a magnesium supplement that made a huge difference for me when I was going through my health crisis. But it doesn’t taste all that great and it’s a *lot* of magnesium. What if you really aren’t majorly magnesium deficient, or if you want a gentler way to get your minerals? This is a *fantastic* solution, and one I’m starting to implement for our whole family. It not only gives the water a perfectly balanced taste, but you get a steady (but gentle) mineral content and alkaline water all in one! What Do I Need to Make Alkaline Water? You’ll need a 2 liter of soda water (just carbonated water), and a bottle of plain Milk of Magnesia. That’s it. And the cool thing: this will make a concentrate- you only have to add 2 Tablespoons (one ounce) per gallon of drinking water. So this concentrated solution is enough to treat over 36 gallons of water! And it tastes *great*. The plain Milk of Magnesia (or magnesium hydroxide) is normally sold as a laxative, because the body isn’t able to effectively break the bond between the magnesium and hydroxide atoms. Because the body can’t break it down, the magnesium is not absorbed and it triggers a quick exit, which is why it’s such an effective laxative. Is This A Quality Magnesium Supplement? In short: yes! Magnesium bicarb is purported to be absorbed at somewhere around a 50% rate, and in studies has raised blood levels of magnesium on par with IV infusions. Compared to solid tablet forms, a liquid form is much more desirable for absorption. Many thanks to the inspiration behind this recipe over at greenclays.com Read more about the importance of using bicarbonate with magnesium here. How Much Magnesium Does It Contain? By my calculations, each 8 ounce glass of alkaline water (using just 1 ounce per gallon of the concentrate below) yields about 5 mg of magnesium and about 2.5 mg of bicarbonate. I try to drink 9 cups of water a day, so that’s a nice steady supply of mineral water. I keep my 2 liter concentrate labeled and in the back of the fridge, and I add it to a container of drinking water in the fridge each morning, so our whole family can enjoy the benefits. 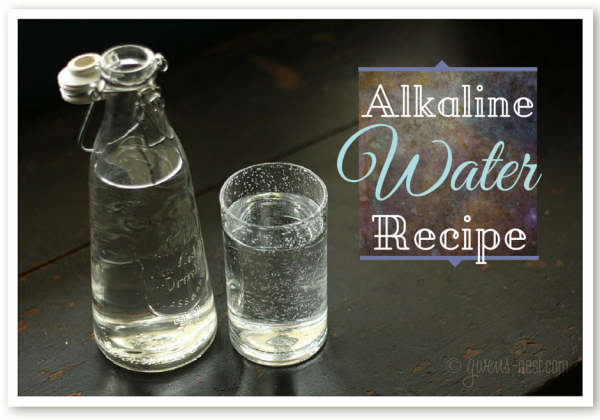 An easy alkaline water recipe that adds a boost of minerals to your everyday drinking water. Open your 2 liter of soda water. I like to place it in the sink just in case it overflows. Use a small fork and stick the tines down into the opening of the bottle. This also helps pop the bubbles so it won't overflow. If your soda bottle is very full, pour off a few Tablespoons of water to make room for the Milk of Magnesia. Pour the Milk of Magnesia down the fork tines into the bottle. Put the lid on quickly and shake. Place in the fridge for half an hour or so, and shake again. This is your *concentrated* magnesium supplement. You'll add 2 Tablespoons of this concentrate per gallon of drinking water, so this 2 liter will treat over 36 gallons of water, turning it into alkaline water! Per 8 oz. 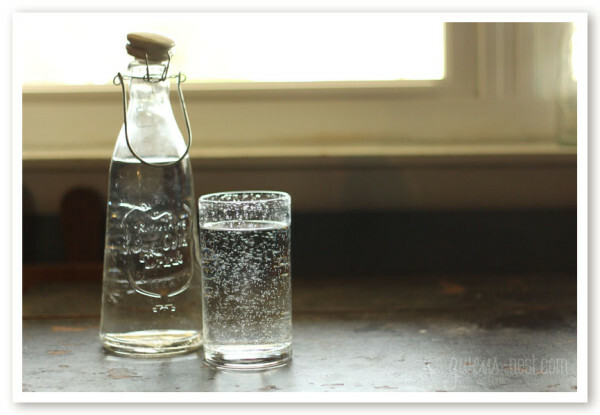 glass, the diluted alkaline water contains about 5 mg of magnesium and 2.5 mg of bicarbonate. The water with carbon (carbonated water) reacts with the magnesium hydroxide (Milk of Magnesia) to create magnesium bicarbonate. So the “soda water” are you talking club soda or is it the sparkling water or seltzer water? Just sparkling water: carbonated water. Different labels call it different things. 🙂 The ingredients should just be carbonated water. Thank you! I’ve seen the pricey bottles of water at stores, but this makes it much more affordable–and convenient. Love your helpful, useful and realistic articles! I recently read the first post you did about this and started making the magnesium water. I had been feeling like I should supplement magnesium for a while, but I was reluctant to spend the money on a quality supplement. I use 2T. of MOM /liter. My favorite way to drink it is to use about 1 c. of the magnesium water, juice of half a lime, 1T. of ACV, and pinch of Celctic Sea Salt, 5 drops stevia and blend it up with 1 frozen strawberry. Then I just add water and ice to fill my 20 oz. cup. I CRAVE this drink! I just couldn’t do GGMS, but I love this. After the concentrate is mixed with the water, must it be refrigerated? I refrigerate overnight, but I’ll keep my bottle out during the day. It’s basically mineral water, so refrigeration isn’t necessary but it would keep it fresher tasting if you’re mixing up a gallon and drinking it over the course of several days or something. Does the Good Girl Moonshine with its acidic ingredients work against the mineral water for a alkaline body? GREAT question! You hear a lot about the importance of an alkaline body, but the first stop in the digestive system is designed to protect against pathogens and foreign microbes with a healthy dose of stomach acid. However, digestion and absorption past the stomach needs an alkaline environment. So the pancreas neutralizes the food as it leaves the stomach with a what is essentially a baking soda wash and a shot of enzymes to boost the digestion and breakdown of the foods through the small intestines. The emphasis on an alkaline environment in the body is referring to the lymphatic/intercellular fluid, and that’s supported by an overall healthy balanced diet with plenty of minerals (like magnesium, chloride, carbon, etc.) and nutrient & fiber rich foods. Plus avoiding refined sugars/foods. SO…all that to say that using acidic foods helps to boost the action of the stomach, and so long as you’re not overdoing acids, they can be a healthy part of an alkalizing diet. (Just be sure to protect your teeth if you’re drinking acids in drinks daily). And if you’re doing GGMS, I highly recommend reading up on the healthier form of cinnamon! How does this compare with that water? I guess I’m wondering what exactly ionization is and how the MOM makes carbonated water ionized. Also, can you just mix this up in the plastic water bottle or will that leach chemicals because of the MOM? You can use glass if you want to, but I just use the bottle that the carbonated water comes in. Leaching happens from heat and acidity, and MOM (and the minerals in soda water) are basic, so I don’t worry too much about leaching. If you’ll follow the links in the post, there are better explanations that I can give, but basically it’s a chemical reaction that re-distributes the ions into the water, creating magnesium carbonate, which is more easily absorbed. I’ve not looked into water ionizers much, but I believe that they use electricity to create water with a nearly neutral ph? This basically uses magnesium to achieve the same thing, plus you get a mineral in there to boot. Would it be possible to add apple cider vinegar to the mineral water and still have the same benefit? Have you researched to know if I can take this while pregnant. I really want to get my reserves back up but also want to be cautious in what I am taking in as things can effect the baby. I can tell you that when I was pregnant, my midwife was fine with me taking pretty large doses of magnesium, though she had me cut back later on in the pregnancy to be sure we weren’t calming down those uterine muscles too much. 🙂 I was taking doses FAR larger than this mineral water. You may want to run this by your OB just to let them know you’re considering it. 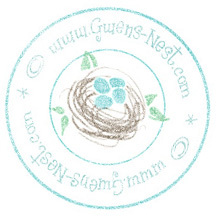 Hi, Gwen! In your pic, the water looks clear. I tried this using plain MOM – the MOM was white and no matter how many times I shake the bottle, the water is whitish and eventually the MOM settles to the bottom. I used soda water, which does have some other ingredients, like sodium benzoate, sodium citrate, sodium bicarbonate, etc. Is this why it’s staying white and the MOM isn’t staying mixed in? Thanks! My guess would be that the other ingredients are interfering with the reaction. 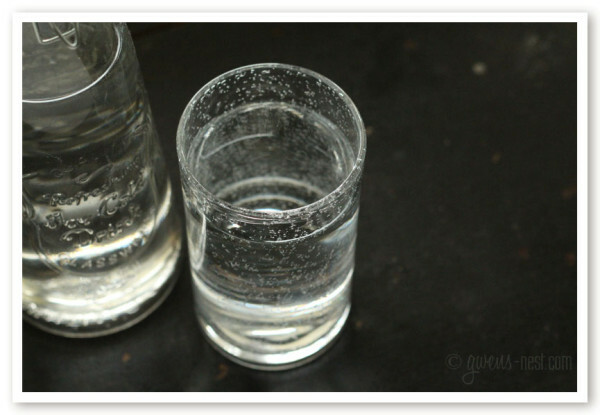 Try just plain carbonated water with a 1/4 tsp. of baking soda added first. I have the same problem with the settling. I used carbonated water that we made ourselves with a soda stream. Does it need to have the baking soda in it? Would that help? I know that magnesium can interfere with the absorption/potency of many medications. Would the amount in this alkaline water work against you if you drank it with daily medication? Just wondering if that’s something that should be considered. I give the amount per cup, so that’s something that you’d want to discuss with your doctor or pharmacist. 🙂 Great question! Maybe make up the concentrate and try it at the lower concentration for a week, and then up it and assess for yourself which one you enjoy and fits your needs? Both recipes will give the water an alkaline ph, so the only difference is the amount of magnesium. If you have a deficiency, you may enjoy higher concentrations of mag. Have you heard anyone have success with constipation while drinking alkaline water. THM is really wreaking havoc on my bowels. Sorry TMI, but it is a very big issue right now for me. I chug water constantly and its just not helping. I am 100% on plan and have been for 8 months. I don’t think that alkaline water is going to be your answer in this case. I know that they address constipation in the book (recommending mag oxide tablets every night to get adjusted). However, if you’re having long term consistent constipation, then try using some electrolytes and possibly look at having a sensitivity to some of the foods? Hope you find a solution quickly! Are you adding this to tap water, bottled spring water, bottled drinking water, or bottled distilled water? I have seen alkaline drops where they say to add to distilled water. Just wanted to check what you recommend? Personally, I use a Berkey filtration system with the fluoride filters. It leaves the mineral content in tact. My alkaline water seems to have bits of white floating in it when made, and sometimes large chunks after a time in the refrigerator. Am I doing something wrong? Nope! 🙂 That’s typical, and nothing to worry about. It’s just some of the mag coming out of solution. This is a great post! We got a Soda Stream machine as a wedding gift that has been gathering dust in our garage now I have a reason to keep it! Is this water recipe suitable for using to make tea? Here in England everyone drinks copious amounts of tea. I am trying to persuade my cousin to use Alkaline water, she will drink water but tea would encourage her more. I was thinking of buying a water alkaliner, but I think I’m going to try this easy recepie first, sounds great. Just wondering what’s the difference between your alkaline water and the magnesium supplement? Hi there. This is the Alkaline Recipe I have. What about using 1 organic lemon, 4 cups of filtered/purified water, 1 Tablespoon Himalayan salt or Sea Salt, 1 large glass jar. Pour water into jar, slice lemon and add to water, do not squeeze out juice, add salt, cover jar, leave at room temperature for 12 – 24 hours. Drink 3 glasses of the Alkaline water first thing in the morning on an empty stomach. 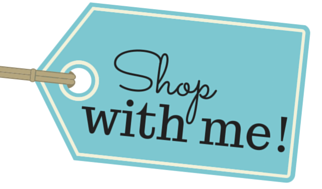 I am making my alkaline water with Coral-Mine. It is not only changes water pH, but also oxidation redox potential, tension surface as well as water structure. It is naturally ionized water. Amazing health benefits. And it is very convenient to make it almost everywhere. is recipe 1 liter or 2 liters? I just noticed All my sparkling water comes in 1 liter bottles? So would I half the amount of MOM? Is it bad to add ‘more’ MOM than the recipe calls got? I’ve never noticed any larger bottles at my store? Some are actually smaller! Just want to verify my amounts for greatest benefit. Thanks!